Automatic Sleep Tracking for the Apple Watch. Sleep tracking should be as easy and effortless as possible. With Pillow v.3.6 we’re (finally) introducing automatic sleep tracking using the Apple Watch. This is a very big update that took a lot of time and effort to make sure it works as expected and at the same time feels like a natural addition to Pillow’s existing features. Automatic sleep tracking means that Pillow no longer requires you to press any buttons to track your sleep. If you have an Apple Watch, simply enable Pillow’s “Automatic” mode once and just wear your Apple Watch during sleep. As long as Pillow’s Automatic mode is enabled Pillow will automatically detect and analyze your sleep every day. You can open Pillow anytime during the day to check your sleep analysis, set your mood or add notes to that sleep session. One thing that’s worth noting is that Alarms and Audio recordings are currently not possible in Automatic mode due to the way Apple Watch and watchOS works. However, we’ll keep looking for ways to bring this functionality. If, for whatever reason, you don’t like Automatic mode or you want to use your iPhone or iPad to track your sleep, you can turn off Automatic mode and switch back to Manual mode. Every single feature available in manual mode is still there and it’s not going away. Manual mode is still a very popular way to track sleep with Pillow and we’ve got great new features coming up for those who want to use Pillow in that mode. Since the very first version of Pillow, when you launch the app, you are taken directly to the Alarm Setup view where you see a picker that you can use to set up your wake-up time. That’s great if you want to use Pillow in manual mode. However, it doesn’t make sense when you when Automatic mode is on. We also felt that Pillow was always missing a view where you can easily get a quick and meaningful summary of your sleep every day. Those two problems led us to create what we call the “Sleep Diary“ view. 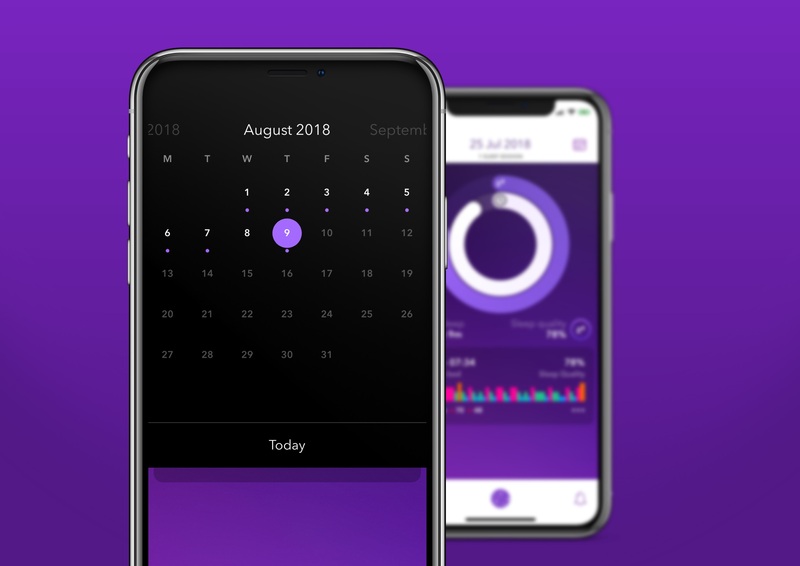 The Sleep Diary gives a quick and visual overview of what matters when you want to get an idea of how well you slept last night: Two concentric rings, one for the Time Asleep and the other for your Sleep Quality for that day, and a list of all the detected sleep sessions in a condensed and simplified form. Tapping on each one of the detected sessions takes you to the detail view where you can get in-depth information about that night. 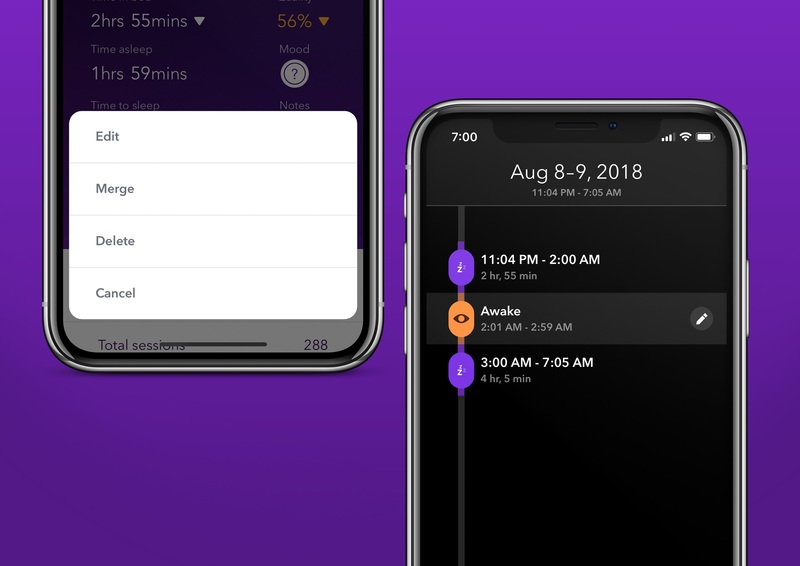 The Sleep Diary is only accessible if you enable Automatic mode both from the iPhone and the Apple Watch. However, we’re working on a major redesign of Pillow that will provide access to that view in both Automatic and Manual modes. An important part of the Sleep Diary view is the Sleep Calendar. Tapping on the calendar icon on the top right corner displays a monthly calendar that lets you access previous days. If Pillow has detected one or more sessions for that day, you’ll see a little purple dot. 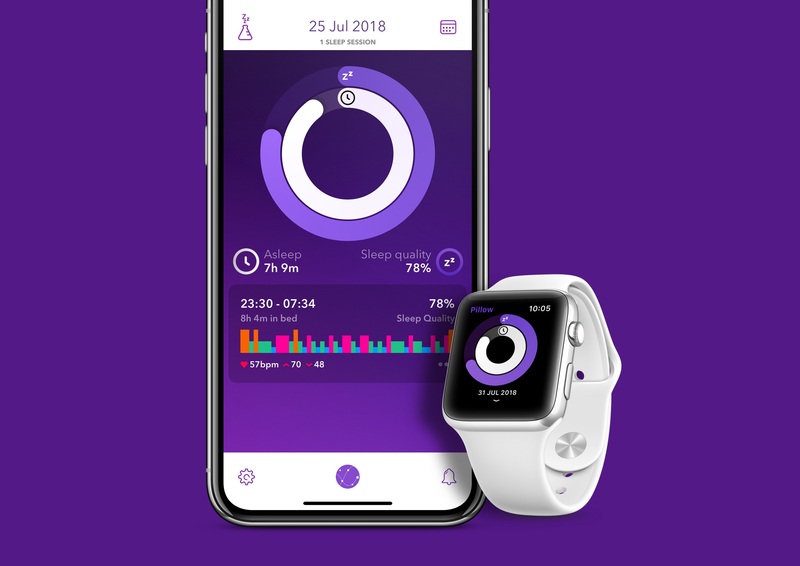 Tapping on a day that doesn’t have any sleep sessions detected, will take you to that day and Pillow will automatically try to detect any sessions, provided that you did wear your Apple Watch during sleep. That’s a great way to detect sessions in the past, and you can go as far back in time as you want! You can select to receive a notification when Pillow detects a sleep session or schedule that notification to appear after a specific time. 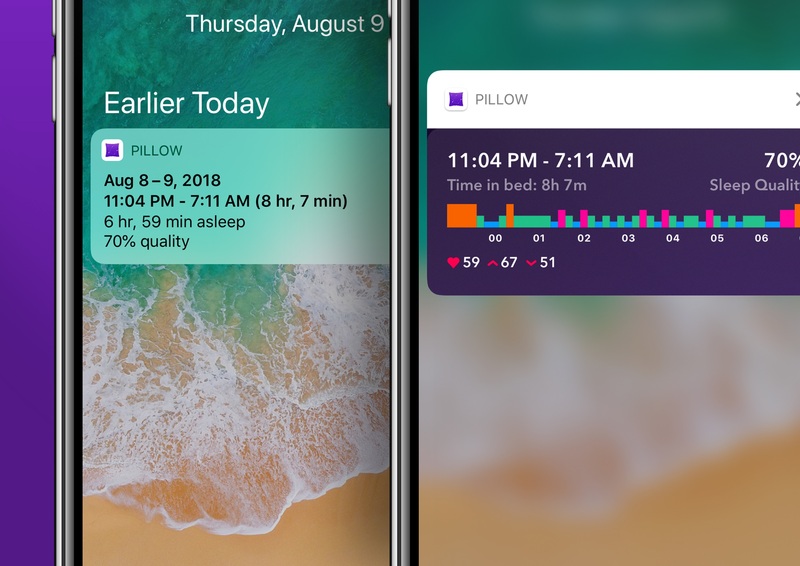 Pillow uses rich notifications so that you can view your sleep report and sleep stage diagram without having to open the app. Last but not least, this update gives even more flexibility in the way you can handle detected sleep sessions. Pillow's edit session dialog now allows you to increase the duration of your sleep session by adding time at the beginning or end of the sleep session or merge two sleep sessions as long as they are less than six hours apart. Now that Automatic sleep tracking mode is done we’ll be working full speed in our next major version, Pillow v.4.0 that will bring many new features and a complete redesign that will make Pillow a lot easier and intuitive to use. Subscribe to our mailing list if you want to receive news and updates about any upcoming features and updates. Pillow is available for free on the App Store and the new Automatic Sleep tracking features come as a free upgrade to all existing users. Enjoy!